The weekend flew by over here too! My bento for Monday is not even worth taking a picture! Have a great day! Hope your kids will pass all of those quizzes..
kepala butterfly dan sungutnya pakai apa ya..? Such cute butterflies. You are so creative even when being quick! @megan : Those baby corns were stuffed with carrots ;) I love to surprise them with the layer rice and let them guess what is in between hehehe ... Thanks a lot Megan for your sweet comment! This is so ingenious.. I'd never have thought to use baby corn like that. I gotta take notes here. lol. I love that little Frog sauce container! What is an egg sheet? I'm such a newbie. lol. Adorable bento! @Chantale : Thanks a lot Chantale for your kind comment! I posted before about Egg Sheet, you can take a peek ;) Hope that post can give you the idea. 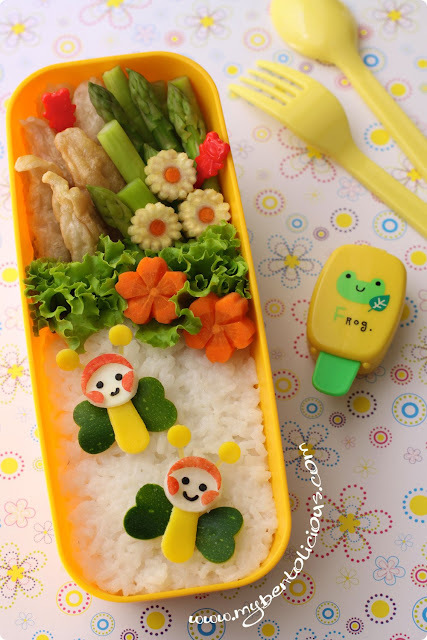 even your quick bentos are so lovely! Lia, these butterflies look so happy. :) And I really love how you've made flowers out of the baby corn. So beautiful! The combo of curry tuna and rice has me drooling! I want to try some otak otak if I can get it. Super adorable butterflies. This bento is not only cute but also delicious, I'm sure! Nice shot, how can u make it??? Ide lo gak ada abisnya...top deh! @mia : Thanks a lot Mia! Wow I would love it if cutters would make my bentos look like that! I especially like the carrot flowers. I think the way you did the corn flowers was really lovely, hope you don't mind if I try it sometime! You called these quick and simple???? It will takes me hours to get something so pretty in the boxes! You are one great bentoist Lia! All the best to your kids in their exam! Mine is having it this week! @Angeleyes : Thanks a lot Alice! It was pretty quick and simple because just need the cut from the cutters hehehe :D All the best for your kids too on their exam! @Coffee and Vanilla : Thanks a lot Margot!